^ N. Devereux, H. Ford, Z. Tsvetanov, and J. Jocoby. STIS Spectroscopy of the Central 10 Parsecs of M81: Evidence for a Massive Black Hole. Astronomical Journal. 2003, 125: 1226–1235. doi:10.1086/367595. ^ 4.0 4.1 4.2 4.3 S. J. O'Meara. The Messier Objects. Cambridge: Cambridge University. 1998. ISBN 0-521-55332-6. ^ K. G. Jones. Messier's Nebulae and Star Clusters 2nd. Cambridge: Cambridge University Press. 1991. ISBN 0-521-37079-5. ^ 6.0 6.1 P. G. Pérez-González, R. C. Kennicutt, Jr., K. D. Gordon, K. A. Misselt, A. Gil de Paz, C. W. Engelbracht, G. H. Rieke, G. J. Bendo, L. Bianchi, S. Bossier, D. Calzetti, D. A. Dale, B. T. Draine, T. H. Jarrett, D. Hollenbach, M. K. M. Prescott. Ultraviolet through Far-Infrared Spatially Resolved Analysis of the Recent Star Formation in M81 (NGC 3031). Astrophysical Journal. 2006, 648: 987–1006. doi:10.1086/506196. ^ 7.0 7.1 K. D. Gordon, P. G. Pérez-González, K. A. Misselt, E. J. Murphy, G. J. Bendo, F. Walter, M. D. Thornley, R. C. Kennicutt, Jr., G. H. Rieke, C. W. Engelbracht, J.-D. T. Smith, A. Alonso-Herrero, P. N. Appleton, D. Calzetti, D. A. Dale, B. T. Draine, D. T. Frayer, G. Helou, J. L. Hinz, D. C. Hines, D. M. Kelly, J. E. Morrison, J. Muzerolle, M. W. Regfan, J. A. Stansberry, S. R. Stolovy, L. J. Storrie-Lombardi, K. Y. L. Su, E. T. Young. Spatially Resolved Ultraviolet, Hα, Infrared, and Radio Star Formation in M81. Astrophysical Journal Supplement Series. 2004, 154: 215–221. doi:10.1086/422714. ^ NASA/IPAC Extragalactic Database. Results for extended name search on NGC 3031. [2007-02-27]. ^ J. Ripero, F. Garcia, D. Rodriguez, P. Pujol, A. V. Filippenko, R. R. Treffers, Y. Paik, M. Davis, D. Schlegel, F. D. A. Hartwick, D. D. Balam, D. Zurek, R. M. Robb, P. Garnavich, B. A. Hong. Supernova 1993J in NGC 3031. IAU Circular. 1993, 5731. ^ 10.0 10.1 B. P. Schmidt, R. P. Kirshner, R. G. Eastman, R. Grashuis, I. dell'Antonio, N. Caldwell, C. Foltz, J. P. Huchra, A. A. E. Milone. The unusual supernova SN1993J in the galaxy M81. Nature. 1993, 364: 600–602. doi:10.1038/364600a0. ^ 11.0 11.1 11.2 A. V. Filippenko, T. Matheson, L. C. Ho. The "Type IIb" Supernova 1993J in M81: A Close Relative of Type Ib Supernovae. Astrophysical Journal Letters. 1993, 415: L103–L106. doi:10.1086/187043. ^ P. J. Benson, W. Herbst, J. J> Salzer, G. Vinton, G. J. Hanson, S. J. Ratcliff, P. F. Winkler, D. M. Elmegreen, F. Chromey, C. Strom, T. J. Balonek, B. G. Elmegreen. Light curves of SN 1993J from the Keck Northeast Astronomy Consortium. Astronomical Journal. 1994, 107: 1453–1460. doi:10.1086/116958. ^ J. C. Wheeler, E. Barker, R. Benjamin, J. Boisseau, A. Clocchiatti, G. de Vaucouleurs, N. Gaffney, R. P. Harkness, A. M. Khokhlov, D. F. Lester, B. J> Smith, V. V. Smith, J. Tomkin. Early Observations of SN 1993J in M81 at McDonald Observatory. Astrophysical Journal. 1993, 417: L71–L74. doi:10.1086/187097. ^ M. W. Richmond, R. R. Treffers, A. V. Filippenko, Y. Palik, B. Leibundgut, E. Schulman, C. V. Cox. UBVRI photometry of SN 1993J in M81: The first 120 days. Astronomical Journal. 1994, 107: 1022–1040. doi:10.1086/116915. ^ A. V. Filippenko, T. Matheson, A. J. Barth. The peculiar type II supernova 1993J in M81: Transition to the nebular phase. Astronomical Journal. 1994, 108: 2220–2225. doi:10.1086/117234. ^ I. D. Karachentsev. The Local Group and Other Neighboring Galaxy Groups. Astronomical Journal. 2005, 129: 178–188. doi:10.1086/426368. ^ 17.0 17.1 17.2 M. S. Yun, P. T. P. Ho, K. Y. Lo. 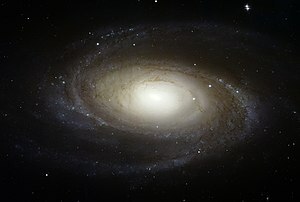 A high-resolution image of atomic hydrogen in the M81 group of galaxies. Nature. 1994, 372: 530–532. doi:10.1038/372530a0. ^ 18.0 18.1 18.2 D. J. Eicher. The Universe from Your Backyard. Cambridge: Cambridge University Press. 1988. ISBN 0-521-36299-7.